The subject of British Armour deployment in WWII has not been covered in the same detail as the other major combatants of this conflict. It is therefore welcome to see this changing over the last few years with excellent and affordable references such as the Concord Armor at War Range to which this title belongs. It is his fourth Concord title and follows on from his previous titles devoted to British Armour. 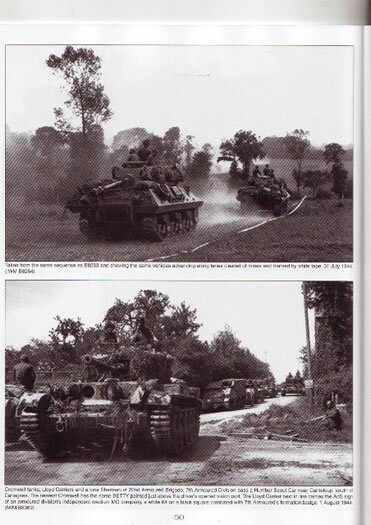 The Author has compiled a great collection of photos covering all the major types of armour deployed by the British Army in the North West Europe campaign of 1944-5. He has again managed to identify almost all the units these belong to. Considering what little information that has previously been published on this genre, that is no mean feat. The pictures are mainly sourced from the excellent IWM collection with some from personal collections. Unlike the previous title, many of the pictures are displayed in large clear images, which is a great advantage to the detail-obsessed modeller. 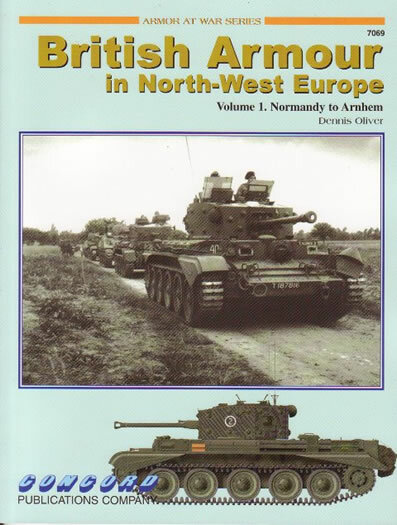 Like most Concord titles, this book follows the standard format leading off with a concise but accurate description of the major British armour formations deployed in the Northwest Europe theatre of operations. This covers the Armoured Divisions plus the Armoured Brigades, Armoured units of the Royal Artillery and Engineers plus the Divisional Recce and Cavalry units. Dennis covers the units individually in one or two paragraphs with a brief detail of equipment campaigns and unit markings. Please note that it covers only British formations and does not cover Commonwealth Formations. 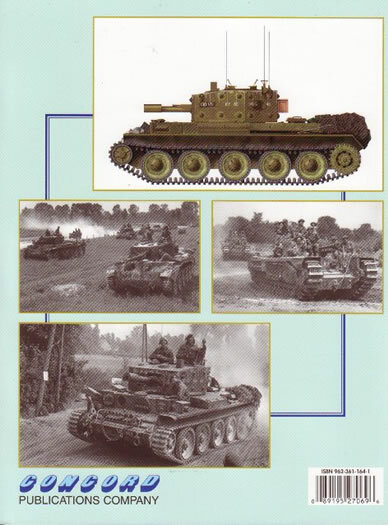 Types covered in the photographs include armoured cars, scout cars, light tanks (M3, M3A3, M5 etc), Shermans (I, II, III and V, Funnies), Cromwells and Centaurs, Churchills (III,IV,V, , VI and VII plus Funnies & AVRE); Bren & Universal Carriers, Tank Destroyers and SPGs (M7 & Bishop) and even Cromwell AA variants. Some photographs are previously unpublished and I believe the author has achieved a good spread of types covered with most appearing in high resolution for the first time. Some people have commented that this book offers little new and that all the photos have been seen before but I would challenge that assertion as I can think of no single title with so many clear pictures shown in this one. The majority of photos would be familiar to anyone who has searched through the IWM’s online collection, but these are presented in a larger and more detailed format than the online collection. All IWM pictures have the reference number if you want to order your own copies. This book is an excellent complement to the two volumes by David Fletcher on the same subject and also by Concord. The book is not without fault however. The publishers have modified Dennis’s artwork of the Centaurs so that the caption of the second profile (Seawolf) does not correspond to the illustration. They have also stretched the Cromwell on the cover. I would recommend this title to anyone with an interest in the British Armour or the NWE campaign. 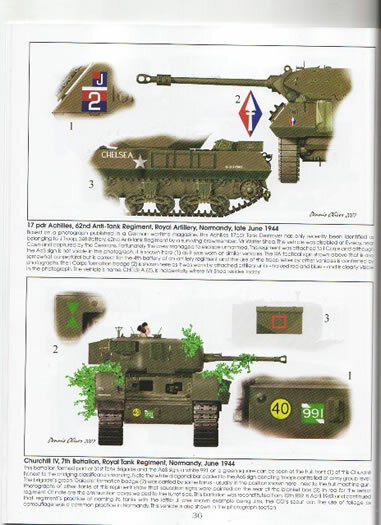 It will be a great source of inspiration to modellers particularly with the excellent new Shermans on the market and the Bronco Humber Scout cars and Staghound Armoured cars. If you’ve ever wondered what to do with the Tamiya Centuars, see plates 1 & 2. This is another welcome title for the long-suffering fan of British Armour and as such highly recommended. The pictures are well selected and some rare gems can now be seen in the backgrounds of some of them. 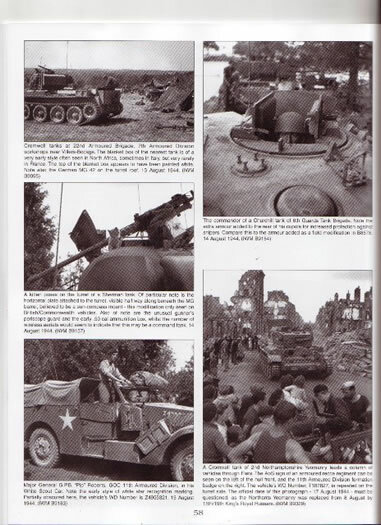 The captions are thoroughly researched and identify a lot of previously unidentified vehicles to units and places.